The predominantly black floor and grey walls have had an adverse affect on the amount of reflected light in the garage. 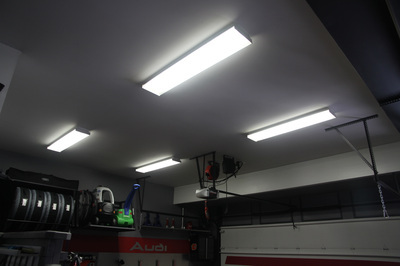 I have always used supplemental light sources (LED lamps from Home Depot) when I am detailing, which I will continue to do, but I needed to upgrade the overall lighting situation. My brother-in-law is an electrical contractor and he presented me with a number of options. I considered swapping out my 2-lamp T8's for T5, T5 HO, T5 vapor sealed or LED's, but I decided to keep and add more of the existing fixtures. With the 32 watt "cool white" Sylvania bulbs, they actually throw a clinical tone of light which reminds me of LED's. Planning the lighting layout was tricky. I ended up adding five new fixtures, four of which run perpendicular to the existing four. The garage rail mounting brackets were the biggest obstacle. 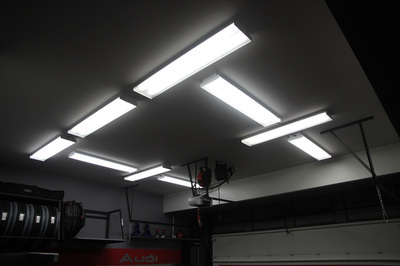 I wanted to install the side bank of lights further out towards the walls, but the garage punch-out brackets were in the way. Although my original plan didn't work out, I am pleased with the layout because it is symmetrical, and more importantly, it has flooded previously dim areas of the garage with tons of light. I now have 18 bulbs instead of 8. The difference is substantial. ​The fixtures are manufactured by Visioneering which is a brand of the Viscor Group out of Toronto. The units are 2-lamp models of the MNE "Magic Neutron" line of surface mounted fluorescent fixtures. The model number is MNE248-T832N120. Full spec sheet can be seen here. The bulbs are 32-watt "cool white" by Sylvania.